Christine Madeleine Odette Lagarde (French: [kʁistin madlɛn ɔdɛt laɡaʁd]; née Lallouette, IPA: [laluɛt]; born 1 January 1956) is a French lawyer and politician serving as the Managing Director (MD) and Chairwoman of the International Monetary Fund (IMF) since 2011. She previously held various senior ministerial posts in the Government of France: she was Minister of the Economy, Finance and Industry (2007–2011), Minister of Agriculture and Fishing (2007) and Minister of Commerce (2005–2007). Lagarde was the first woman to become Finance Minister of a G8 economy and is the first woman to head the IMF. A noted anti-trust and labour lawyer, Lagarde was the first female chair of the major international law firm Baker & McKenzie, between 1999 and 2004. On 16 November 2009, the Financial Times ranked her the best Finance Minister in the Eurozone. 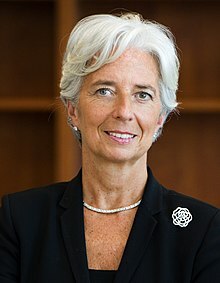 On 28 June 2011, she was named as the next Managing Director of the IMF for a five-year term, starting on 5 July 2011, replacing Dominique Strauss-Kahn. Her appointment is the 11th consecutive appointment of a European to head the IMF. In 2014, Lagarde was ranked the 5th most powerful woman in the world by Forbes magazine. She was reelected by consensus for a second five-year term, starting 5 July 2016, being the only candidate nominated for the post of Managing Director. In December 2016, a French court found her guilty of negligence for her role in the Bernard Tapie arbitration, but did not impose a penalty. In 2018, Forbes ranked her number three on its World's 100 Most Powerful Women list. Lagarde was born in Paris, France, into a family of academics. Her father, Robert Lallouette, was a Professor of English; her mother, Nicole (Carré), was a Latin, Greek and French literature teacher. Lagarde and her three brothers, all younger, spent their childhood in Le Havre where she attended the Lycée François 1er and Lycée Claude Monet. As a teenager, Lagarde was a member of the French national synchronised swimming team. After her baccalauréat in 1973, she went on an American Field Service scholarship to the Holton-Arms School in Bethesda, Maryland. During her year in the United States, Lagarde worked as an intern at the U.S. Capitol as Representative William Cohen's congressional assistant, helping him correspond with French-speaking constituents during the Watergate hearings. She graduated from Paris West University Nanterre La Défense, where she obtained master's degrees in English, labor law, and social law. She also holds a master's degree from the Institut d'études politiques in Aix-en-Provence. Since 2010, she has presided over the Aix school's board of directors. She also prepared for the École nationale d'administration's entrance exam but ultimately failed to gain admission to the elite school. Lagarde is divorced and has two sons, Pierre-Henri Lagarde (born 1986) and Thomas Lagarde (born 1988). Since 2006, her partner has been the entrepreneur Xavier Giocanti from Marseille. A health-conscious vegetarian who rarely drinks alcohol, Lagarde's hobbies include regular trips to the gym, cycling, and swimming. Lagarde joined Baker & McKenzie, a large Chicago-based international law firm, in 1981. She handled major antitrust and labour cases, was made partner after six years and was named head of the firm in Western Europe. She joined the Executive Committee in 1995 and was elected the company's first female Chairperson in October 1999. As France's Trade Minister between 2005 and May 2007, Lagarde prioritized opening new markets for the country's products, focusing on the technology sector. On 18 May 2007, she was moved to the Ministry of Agriculture as part of the government of François Fillon. The following month she joined François Fillon's cabinet in the Ministry of Economic Affairs, Finance and Employment to become the first woman in charge of economic policy in France. She was the only member of the French political class to condemn Jean-Paul Guerlain's racist remarks of 2010. On 25 May 2011, Lagarde announced her candidacy to be head of the IMF to succeed Dominique Strauss-Kahn, upon his resignation. Her candidacy received the support of the British, Indian, United States, Brazilian, Russian, Chinese and German governments. The Governor of the Bank of Mexico (and former Mexican Secretary of Finance) Agustín Carstens was also nominated for the post. His candidacy was supported by many Latin American governments, as well as Spain, Canada and Australia. On 28 June 2011, the IMF board elected Lagarde as its next Managing Director and Chairman for a five-year term, starting on 5 July 2011. The IMF's executive board praised both candidates as well-qualified, but decided on Lagarde by consensus. Lagarde became the first woman to be elected as the head of the IMF. Carstens would have been the first non-European. Her appointment came amid the intensification of the European sovereign debt crisis especially in Greece, with fears looming of loan defaults. The United States in particular supported her speedy appointment in light of the fragility of Europe's economic situation. U.S. Treasury Secretary Timothy Geithner said that Lagarde's "exceptional talent and broad experience will provide invaluable leadership for this indispensable institution at a critical time for the global economy." Nicolas Sarkozy referred to Lagarde's appointment as "a victory for France." Oxfam, a charity working in developing nations, called the appointment process "farcical" and argued that what it saw as a lack of transparency hurt the IMF's credibility. On 17 December 2015, Michel Sapin, French Finance Minister, said that Lagarde could stay on as head of the IMF, despite being charged with criminal negligence. Throughout her time at the IMF, she has repeatedly ruled herself out of the races to secure a top job in Europe, including the positions of President of the European Commission or President of the European Central Bank. In July 2010, Lagarde told the PBS NewsHour that the IMF's lending program for distressed European countries was "a very massive plan, totally unexpected, totally counter-treaty, because it wasn't scheduled in the treaty that we should do a bailout program, as we did." She also said, "we had essentially a trillion dollars on the table to confront any market attack that would target any country, whether it's Greece, Spain, Portugal, or anybody within the eurozone." With respect to the French economy, she stated that besides short-term stimulus efforts: "we must, very decisively, cut our deficit and reduce our debt." In public remarks made right after her appointment, Lagarde stated that both the IMF and EU required Greek austerity measures as a prerequisite for further aid. She said, "If I have one message tonight about Greece, it is to call on the Greek political opposition to support the party that is currently in power in a spirit of national unity." She said of her predecessor that: "The IMF has taken up the challenges of the crisis thanks to the actions of [Managing Director] Dominique Strauss-Kahn and to his team as well." On 25 December 2011, Lagarde argued that the world economy was at risk and urged Europeans to unify in terms of the debt crisis facing the continent. In July 2012, as the Greek economy continued to decline, and the country's leaders asked for an easing of the terms of external assistance, Lagarde said she was "not in the negotiation or renegotiation mood at all." A year later, though, with her own organization conceding that its "rescue" package for Greece had fallen short of what was required, Lagarde—having previously said that Greece's debt burden was "sustainable"—decided that Greece would not recover unless its debt was written off in a meaningful way. According to Yanis Varoufakis, the combative former finance minister of Greece, Lagarde and others at the top of the IMF have been quite sympathetic behind closed doors. As the crisis peaked again in summer 2015, Lagarde's organization made headlines by calling for massive debt relief for Greece, a call she reiterated personally. In 2016, the IMF refused to participate with eurozone countries in further emergency financing for Greece, because concrete measures to relieve the country of its debt burden remained absent. Questioned about her economic philosophy, Lagarde has described herself as "with Adam Smith—that is, liberal." In an interview in May 2012, Lagarde was asked about crisis-stricken Greece, but opted for a less than sympathetic response. She drily referred to Greek tax avoidance, and assented to the interviewer's suggestion that Greeks had "had a nice time" but now "it's payback time." Her comments provoked controversy: Deputy Prime Minister of Greece Evangelos Venizelos said she had "insulted the Greek people", while Greek Prime Minister Alexis Tsipras declared: "We don't need her compassion." In an effort to quell the negative response, the next day Lagarde updated her Facebook page with: "As I have said many times before, I am very sympathetic to the Greek people and the challenges they are facing." Within 24 hours, over 10,000 comments had been left in response, many of them obscene. To her accusations that not enough Greeks paid their taxes, Professor Emeritus John Weeks of the University of London retorted: "The moral weight of Christine Lagarde's matronising of the Greeks to pay their taxes is not strengthened by the fact that, as director of the IMF, she is in receipt of a tax-free annual salary of $468,000 (£298,000, plus perks)." In her defense, "No taxes is the norm for most United Nations employees covered by a convention on diplomatic relations signed by most nations." In January 2015, on the death of King Abdullah of Saudi Arabia, Lagarde said "he was a strong believer in pushing forward women's rights", prompting a number of observers to comment on the life of women generally in Saudi Arabia. In 2010 Lagarde, then Finance Minister of France, sent a list of 1,991 names of Greek customers who were potential tax avoiders with bank accounts at HSBC's Geneva branch to the Greek government. On 28 October 2012, Greek reporter and editor Kostas Vaxevanis claimed to be in possession of the list and published a document with more than 2,000 names in his magazine Hot Doc. He was immediately arrested on charges of breaching privacy laws with a possible sentence of up to two years in prison. After a public outcry, Vaxevanis was found not guilty three days later. Vaxevanis then faced a retrial (the Greek authorities were yet to charge anyone on the list), but was acquitted again. A few days before the Greek general elections of January 2015, when it was clear that left-wing Syriza would come to power, the financial crimes police of the conservative government of Antonis Samaras shredded reams of documents pertaining to corruption cases. On 3 August 2011, a French court ordered an investigation into Lagarde's role in a €403 million arbitration deal in favour of businessman Bernard Tapie. On 20 March 2013, Lagarde's apartment in Paris was raided by French police as part of the investigation. On 24 May 2013, after two days of questioning at the Court of Justice of the Republic (CJR), Lagarde was assigned the status of "assisted witness", meaning that she was not herself under investigation in the affair. According to a press report from June 2013, Lagarde was described by Stéphane Richard, the CEO of France Telecom (a former aide to Lagarde when she was Finance Minister), who was himself put under formal investigation in the case, as having been fully briefed before approving the arbitration process which benefitted Bernard Tapie. Subsequently, in August 2014 the CJR announced that it had formally approved a negligence investigation into Lagarde's role in the arbitration of the Tapie case. On 17 December 2015, the CJR ordered Lagarde to stand trial before it for alleged negligence in handling the Tapie arbitration approval. In December 2016, the court found Lagarde guilty of negligence, but declined to impose a penalty. Lagarde was interviewed in the documentary film Inside Job (2010), which later won an Academy Award for Best Documentary Feature. The fashion magazine Vogue profiled Lagarde in September 2011. Lagarde was portrayed by actress Laila Robins in the 2011 HBO television drama Too Big to Fail, which was based on the popular book of the same name by New York Times journalist Andrew Ross Sorkin. Lagarde presented the 2014 Richard Dimbleby Lecture, titled "A New Multilateralism for the 21st Century". In 2017, Lagarde was listed by UK-based company Richtopia at number 1 in the list of 100 Most Influential People in Multinational Organisations. Honorary doctorate from Université de Montréal. ^ "The disarming charm of Christine Lagarde". Daily Telegraph. Retrieved 12 February 2019. ^ From Ralph Atkins; Andrew Whiffin; FT reporters (16 October 2009). "FT ranking of EU finance ministers". Financial Times. Retrieved 2 January 2010. ^ a b c "IMF Executive Board Selects Christine Lagarde as Managing Director". Press Release. IMF. 28 June 2011. Retrieved 28 June 2011. ^ a b "Lagarde wins IMF top job, presses Greece on crisis". Reuters. 28 June 2011. Retrieved 1 July 2011. ^ a b c d "Christine Lagarde named IMF chief". BBC News. 28 June 2011. Retrieved 28 June 2011. ^ "IMF Managing Directors". IMF. 28 June 2011. Retrieved 1 September 2011. ^ "World's Most Powerful Women". Forbes. Retrieved 29 March 2018. ^ "Le Nouvel Economiste". Nouveleconomiste.fr. Archived from the original on 9 July 2007. Retrieved 21 February 2014. ^ Média, Prisma. "Christine Lagarde - La biographie de Christine Lagarde avec Gala.fr". ^ a b "Christine Lagarde – La biographie de Christine Lagarde avec" (in French). Gala.fr. Retrieved 21 February 2014. ^ "La mujer que oculta acero tras la sonrisa" (in Spanish). El País. Retrieved 24 July 2011. ^ a b Guinness, Molly (17 July 2011). "Is this the world's sexiest woman (and the most powerful)?". London: Guardian.co.uk. Retrieved 4 September 2012. ^ a b "Christine Lagarde: the key facts". Daily Telegraph. London. 25 May 2011. Retrieved 25 May 2011. ^ a b "Interview : Christine Lagarde, la face cachée d'une femme de pouvoir". Latribune.fr. Retrieved 6 September 2012. ^ a b Shapira, Ian, "Christine Lagarde stirs wistful memories for friends in Holton Arms Class of ’74", Washington Post, 29 July 2011. ^ Janet H. Clark (13 August 2013). "Christine Lagarde (French lawyer and politician) – Encyclopædia Britannica". Britannica.com. Retrieved 21 February 2014. ^ "Christine Lagarde : biographie – Le Nouvel Observateur". Tempsreel.nouvelobs.com. 18 May 2007. Retrieved 21 February 2014. ^ "Christine Lagarde, Eleventh Managing Director of IMF – Biographical Information". Imf.org. 14 November 2013. Retrieved 21 February 2014. ^ Marc Saillard. "Christine Lagarde élue à la tête du CA de Sciences po Aix – Educpros". Educpros.fr. Retrieved 21 February 2014. ^ "lexpansion.lexpress.fr/economie/ce-que-vous-ne-savez-pas-sur-c…". 21 February 2014. Archived from the original on 21 February 2014. ^ David Wilkes (23 May 2012). "The seductive IMF boss and a smitten BBC business guru: Lagarde's Gallic charms leave Peston flustered | Mail Online". London: Dailymail.co.uk. Retrieved 21 February 2014. ^ "Contact". Exporter.gouv.fr. Archived from the original on 1 December 2008. Retrieved 21 February 2014. ^ "Xavier Giocanti, le mari de... Christine Lagarde" (in French). Paris Match. Archived from the original on 3 January 2013. Retrieved 21 February 2014. ^ a b c Johnson, Diane (September 2011). "Christine Lagarde: Changing of the Guard". Vogue. Retrieved 4 November 2011. ^ "Firm Facts | Firm History | Baker & McKenzie". Bakermckenzie.com. Archived from the original on 15 June 2014. Retrieved 2014-02-21. ^ "Christine Lagarde, the eleventh European to head the IMF". Thomaswhite.com. 31 July 2012. Retrieved 21 February 2014. ^ "Christine Lagarde: Executive Profile & Biography – Businessweek". Investing.businessweek.com. Retrieved 21 February 2014. ^ "Christine Lagarde biography". Ministry of the Economy (France). Archived from the original on 1 December 2008. Retrieved 2 March 2009. ^ "Décret du 18 mai 2007 relatif à la composition du Gouvernement" (in French). Legifrance.gouv.fr. Retrieved 29 June 2011. ^ "Décret du 19 juin 2007 relatif à la composition du Gouvernement" (in French). Legifrance.gouv.fr. Retrieved 29 June 2011. ^ Macey, David (2012). Frantz Fanon: A Biography (2nd ed.). London and New York, NY: Verso. p. xix. ISBN 978-1-844-67773-3. ^ Sage, Adam (26 May 2011). "Christine Lagarde announces IMF candidacy". thetimes.co.uk. Retrieved 6 August 2015. ^ a b "IMF: US backs Christine Lagarde for top job". BBC News. London. 28 June 2011. Retrieved 29 June 2011. ^ "Germany, Britain back Lagarde to lead IMF". Washington Post. 22 May 2011. Retrieved 22 May 2011. ^ "Soutiens européens à une candidature de Lagarde au FMI". Le Monde (in French). 19 May 2011. Retrieved 22 May 2011. ^ a b "Christine Lagarde announces IMF candidacy". BBC News. 25 May 2011. Retrieved 25 May 2011. ^ "Lagarde suited to head IMF; India voted for her: Pranab". Moneycontrol India. 26 May 2011. Retrieved 26 May 2011. ^ "France's Christine Lagarde wins IMF top job – Haaretz Daily Newspaper | Israel News". Haaretz. Israel. Retrieved 29 June 2011. ^ "Lagarde peut rester à la tête du FMI (Sapin)" [Lagarde can remain at the head of the IMF (Sapin)]. Le Figaro (in French). 17 December 2015. Archived from the original on 18 December 2015. ^ James Politi, Sam Fleming and Alex Barker (September 12, 2018), Christine Lagarde rules herself out of race for top jobs in EU Financial Times. ^ "As IMF's New Chief, Will Lagarde 'Keep Smiling'?". PBS NewsHour. 29 June 2011. Retrieved 29 June 2011. ^ "IMF's Lagarde warns global economy threatened – Business – Stocks & economy | NBC News". MSNBC. 25 December 2011. Retrieved 21 February 2014. ^ "Greece seeks more time to meet bailout terms". Al Arabiya News. AFP. 7 July 2012. Retrieved 10 July 2012. ^ Paris, Coastas; Granitsas, Alkman (4 July 2012). "Greece's Creditors to Take Tough Line". WSJ.com. Retrieved 6 July 2012. ^ Matina Stevis; Ian Talley (5 June 2013). "IMF Concedes It Made Mistakes on Greece". wsj.com. Retrieved 10 June 2013. In an internal document marked "strictly confidential," the IMF said it badly underestimated the damage that its prescriptions of austerity would do to Greece's economy, which has been mired in recession for the last six years. ... Over the last three years, a number of senior IMF figures, including Managing Director Christine Lagarde, have repeatedly said that Greece's debt level was 'sustainable'—likely to be repaid in full and on time. ^ Helena Smith (3 June 2013). "Greece's creditors close to writing off some of its debt". London: The Guardian. Retrieved 3 June 2013. In an implicit recognition that the eurozone's weakest member state will never recover unless some of its debt is forgiven, the International Monetary Fund's managing director, Christine Lagarde, said that Athens' debt pile, projected to reach a staggering 185% of GDP this year, would remain high 'well into the next decade'. ^ Lambert, Harry (13 July 2015). "Exclusive: Yanis Varoufakis opens up about his five month battle to save Greece". newstatesman.com. Retrieved 16 July 2015. ^ Evans-Pritchard, Ambrose (14 July 2015). "IMF stuns Europe with call for massive Greek debt relief". telegraph.co.uk. Retrieved 16 July 2015. ^ Rankin, Jennifer (17 July 2015). "IMF steps up Greek bailout criticism over debt relief package". theguardian.com. Retrieved 21 July 2015. ^ Talley, Ian (25 May 2016). "IMF: No Cash Now for Greece Because Europe Hasn't Promised Debt Relief". wsj.com. Retrieved 25 May 2016. ^ Aitkenhead, Decca (25 May 2012). "Christine Lagarde: can the head of the IMF save the euro?". London: Guardian.co.uk. Retrieved 31 May 2012. ^ Elliott, Larry; Aitkenhead, Decca (25 May 2012). "It's payback time: don't expect sympathy – Lagarde to Greeks". London: Guardian.co.uk. Retrieved 28 May 2012. ^ a b Osborne, Alistair (27 May 2012). "Irate Greeks vilify IMF chief on Facebook after she brands them tax dodgers". The Sunday Telegraph. London. Retrieved 28 May 2012. ^ "Democracy in action". The Economist (2 June 2012). Retrieved 2 June 2012. ^ "Update of 26 May 2012, 09:43". Lagarde's Facebook page. Retrieved 31 May 2012. ^ Weeks, John (27 May 2012). "Letters: IMF boss is in no position to preach". guardian.co.uk. Retrieved 28 May 2012. ^ Aldrick, Philip (29 May 2012). "Christine Lagarde attack on Greece backfires as she pays no tax". telegraph.co.uk. Retrieved 2 July 2015. ^ Wood, Robert (30 May 2012). "TAXES IMF's Christine Lagarde: I Don't Pay Taxes, But You Should". Retrieved 24 April 2018. ^ "King Abdullah – a discreet but strong advocate of women, says IMF chief". theguardian.com. 23 January 2015. Retrieved 6 August 2015. ^ Tran, Mark (23 January 2015). "Lagarde calls King Abdullah 'advocate of women' – despite ban on driving". theguardian.com. Retrieved 6 August 2015. ^ "The Controversial 'Lagarde List' Has Leaked, And It's Bad News For The Greek Prime Minister". Businessinsider.com. Retrieved 28 October 2012. ^ "Greece arrests journalist over 'Lagarde List' banks leak". BBC. 28 October 2012. Retrieved 28 October 2012. ^ Julian Borger (28 October 2012). "Greek magazine editor in court for naming alleged tax evaders". London: The Guardian. Retrieved 29 October 2012. ^ McElroy, Damien (30 October 2012). "Greek officials accused of persecution as 'Lagarde List' journalist appears in court". London: The Telegraph. ^ "Greek journalist Kostas Vaxevanis acquitted in trial for naming alleged tax cheats (UPDATE)". Global Post. 1 November 2012. ^ Daley, Suzanne. "Greece's Aggressive Pursuit of Tax Offenders Appears to Collect More Anger Than Money." New York Times, 28 October 2013. ^ Carassava, Anthee (19 February 2015). "Greece shreds files on tax cheating by rich and powerful". thetimes.co.uk. Retrieved 16 July 2015. ^ Chrisafis, Angelique (4 August 2011). "Christine Lagarde faces inquiry over €285m payout for Sarkozy ally | World news". London: Guardian.co.uk. Retrieved 21 February 2014. ^ "France – French police raid home of IMF boss Christine Lagarde". France 24. ^ "IMF chief Christine Lagarde key witness in Tapie case". Bbc.co.uk. 24 May 2013. Retrieved 24 May 2013. ^ Reuters (25 June 2013). "Christine Lagarde accused over Bernard Tapie 'fraud' – Europe – World". London: The Independent. Retrieved 21 February 2014. ^ John Lichfield (23 May 2013). "IMF managing director Christine Lagarde in court over money to disgraced tycoon Bernard Tapie in 2008 – Europe – World". London: The Independent. Retrieved 21 February 2014. ^ "IMF's Christine Lagarde 'under investigation'". bbc.co.uk. 27 August 2014. Retrieved 27 August 2014. ^ "IMF chief Lagarde to stand negligence trial in France". BBC News. 17 December 2015. ^ Deen, Mark; Mayeda, Andrew (17 December 2015). "IMF's Lagarde to Face Trial for 'Negligence' in Tapie Case". Bloomberg News. Archived from the original on 18 December 2015. ^ Lhomme, Fabrice; Davet, Gérard (18 December 2015). "Tapie-Crédit lyonnais : Christine Lagarde renvoyée devant la justice". Le Monde (in French). ^ "Christine Lagarde, I.M.F. Chief, Is Found Guilty of Negligence". The New York Times. 19 December 2016. Retrieved 19 December 2016. ^ "Power with grace". Ft.com. Retrieved 22 August 2013. ^ "Winners and Nominees for the 83rd Academy Awards". Oscars.org. Retrieved 22 August 2013. ^ Telegraph. Nationalism could destroy global economy, warns Christine Lagarde. 4 February 2014. ^ Economic Times. Inequality increasing globally including in India: Christine Lagarde. 4 February 2014. ^ "Top 100 Leaders from Multilateral Organisations: From Christine Lagarde to António Guterres, These Are the Most Influential People in the NGO Sphere". Richtopia. Retrieved 23 December 2017. ^ "KU Leuven awards honorary doctorate to Christine Lagarde, IMF chief – KU Leuven". Kuleuven.be. Archived from the original on 1 March 2014. Retrieved 21 February 2014. ^ "Université de Montréal presents honorary doctorate to Christine Lagarde". Retrieved 15 December 2015. Wikimedia Commons has media related to Christine Lagarde. "Christine Lagarde collected news and commentary". The Guardian. "Christine Lagarde collected news and commentary". The New York Times.